VACATION YEAR ROUND IN SISTERS!! Mild summers, snow-capped mountains, spectacular fall color & bright blue skies. Snow-skiing & sledding. Great rainbow trout fishing, whitewater rafting, rock climbing, antiquing, golfing, shopping, dining and so much more!!! Park Models & Cottages in an immaculate setting. Such a beautiful and well maintained park! We have stayed here Spring, Summer and Fall and its always an excellent experience. Late Spring and Summer the flowers are gorgeous with snow capped mountains in the background. Some spaces don't have a lot of room between units, while others have fairly large expanses with trees. The park map does a pretty good job of reflecting these differences. All spaces are paved with a brick patio area and varnished picnic table. Putt-putt golf course, swimming pool and hot tub are all well maintained. If you're bringing a dog expect to have them restricted from the gardens and large grassy picnic areas. There is a dog walk path and plenty of space for them to run and play. 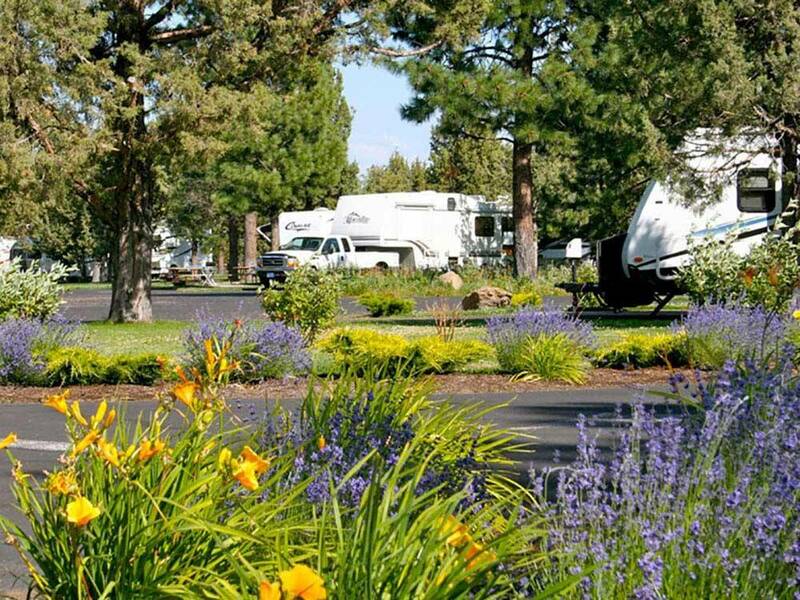 A really nice park located perfectly to enjoy all that central Oregon has to offer! We stayed at park for the quilt show this year and loved it. The staff was friendly, plenty of space to walk the dog, and I was able to let her chase her ball in the rodeo parking area (important for a young lab). While we didn't use the showers, the buildings looked in good repair and clean. We have a 33 foot and were given a pull though site. The services for the rig were clean and in very good repair. It is nice to see a park where attention to hook-ups were thought out. We have already made plans/reservations for next year. The rate entered was the lesser amount as we hit on a season rate change. The higher rate was $55.00. As others have said the wifi is terrible. Get up early to use it while most people are still asleep. The only other negative I can think of is the spots along the highway are probably pretty noisy, which might comprise 10% of the park. Other than that this park is fantastic! We were in spot 84 which is a pull in and had a great view of the lake. The landscaping is beautiful, the roads are well laid out, and you are guided to your spot and assisted in parking. Trash is picked up several times a day, and the staff really makes you feel appreciated. We will definitely be back. Wow, what a great RV park! It is very clean. Love the little lake they have there. The customer service was outstanding! They have a nice little store where you can get essentials. The kids loved the pool and spa and feeding the ducks. We also bought two bundles of firewood which was delivered to our camp site. The site was very large and level. We were lucky to get a site right on the lake. Lost of designated pet runs, but only one was fenced in so they can be off leash. Only draw back was the internet did not work well at all. The lady said it doesn't extend well to that area of the park. I'm not sure why in this day and age so many parks have such horrible internet service?? Seems like a park of this stature would have that figured out. Anyway, that is the only reason, also could have had a few more off leash pet areas, we gave 4 stars instead of 5. Stayed there this past weekend and the park was great, the folks that worked there were very helpful and the place was very clean, thx! This is an awesome campground. The spaces are very well taken care of and the staff is friendly, and best of all their little store has everything you could possible need. The pool and hot tub are nice as well. Really enjoyed our stay. You can rent fishing pole and purchase barbless fly's to fish in there catch and release pond. Very friendly staff. Really enjoyed the spa. Only negative is could make the dog area a little nicer as just dirt does not cut it. At least have a grass area for them. The park is meticulously maintained and beautifully landscaped. 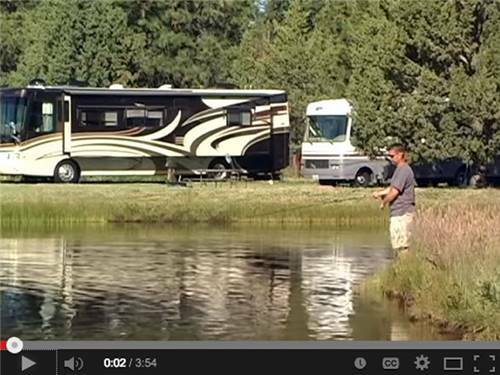 The spaces are pretty tight as you almost have space enough to set up your chairs outside your RV. There is a HUGE field for open space to let your dogs run and play but they also have to go there to potty which can be a nuisance early in the morning or late at night. I don't think it is fair to advertise as having cable when you only have 6 channels and you are lucky if 3 of them work and the same issue with WIFI. I thought some of the staff thought they were doing us a favor by letting us stay there rather than appreciating our business. It is a very pretty park, well-maintained and close to Sisters for exploring all that is in the area. Clean. Nice grass. Grass is so nice that dogs cannot walk on it, but ducks and geese do. In fact, the ducks and geese do do all over the place. Will probably go somewhere else in the future. Absolutely a stunning park. Loved the workout course that was placed along the perimeter of the park. The dog park portion was perfect to let your dogs have a huge space to run or just be dogs. The lawns were beautiful. We did however have a glitch when we arrived after hours, with a nicely posted envelope waiting for us with our site # and found someone else in it who refused to move. We got in touch with staff and they found us another spot... Other than that, I would definately return again. No RV? No Worries. 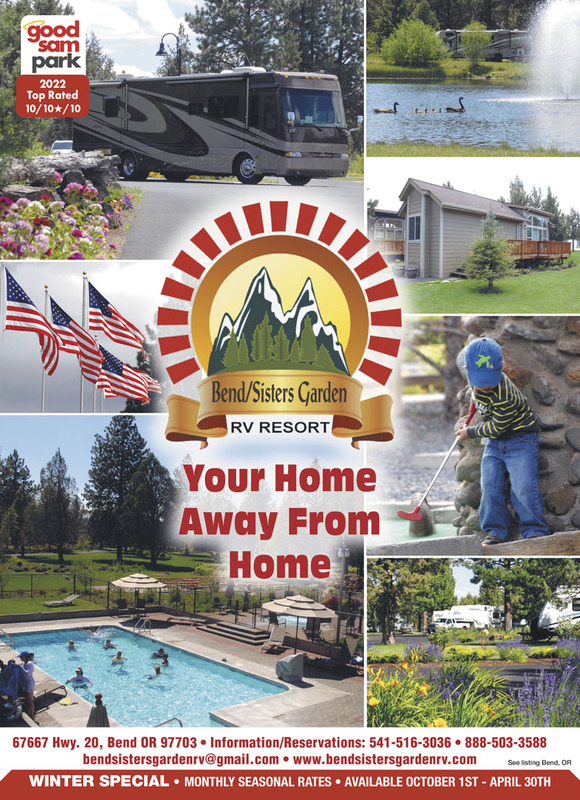 Stay in Lakeside Cabins & Park Models. We offer six cabins and park models sleeping up to six. All sit in our grassy lawns with play areas around. Immaculate restrooms. Fish the ponds, walk our landscaped paths & explore the activities in the Bend/Sisters area.